Widely recognised as one of the UK’s most exciting drummers, Jon Finnigan’s playing blends the frenetic energy and excitement of classic rock drummers like Keith Moon and Ian Paice with the hard-hitting precision and song-focus of modern players like Dave Grohl and Chad Smith. Jon started playing at age 11 and was already gigging by the time he was 13. He studied with Roger Odell (of Shakatak) and legendary drum tutor Bob Armstrong, and completed his grade 8 for the Guildhall School of Music and Drama by 16. 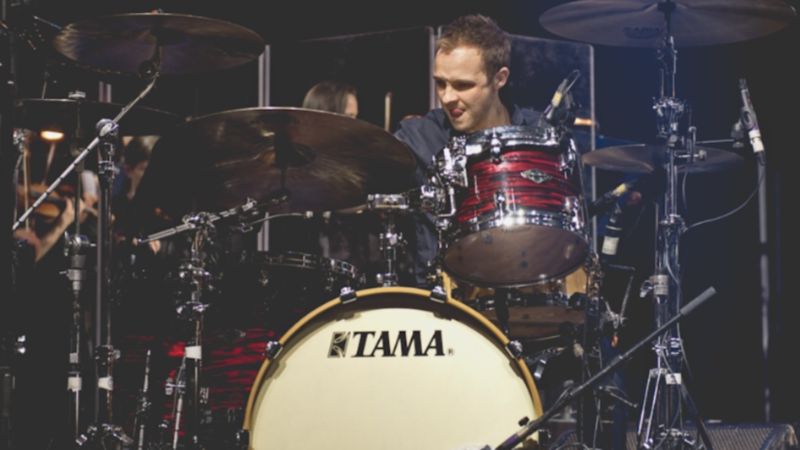 By 18, he had graduating from Drumtech in London, and began working with several bands and artists as a session drummer, both live and in the studio. In 2006, Jon played with the 80s ska band Bad Manners before joining a world/Turkish music act called Oojami. Oojami toured the UK and Europe playing major gigs and festivals, including Royal Albert Hall. In 2007, Jon began playing with Julian Perretta. Jon drummed on many of Julian’s early demos (produced by Jamiroquai guitarist Rob Harris). He then went on to record several tracks on the album (for Sony UK), toured with Julian supporting Girls Aloud on their UK arena tour and Perez Hilton in the USA. Upon returning to the UK, the band were contacted by one of Beyoncé’s team who had seen them play at the Los Angeles venue ‘The Avalon’, and they were asked to guest support on five dates for Beyoncé’s ‘I Am Sasha Fierce’ tour. Julian’s album was subsequently signed to a French label, and Jon played on a final tour across Europe which included TV appearances on the popular French programmes ‘Grand Journal’ (Canal+) and ‘Taratata’. In March 2012, Jon went on a tour in Australia with UK folk band Ahab (featuring Calum Adamson, son of Big Country star Stuart Adamson). In August 2013, he started playing with UK post-punk band Gang of Four and his first gig (at Terraneo Festival in Croatia) aired on MTV. Jon continued to gig with the band and was asked by founding member and record producer Andy Gill to play on their 2015 album ‘What Happens Next?’ Gang Of Four toured the U.S to promote the album in 2015 and on their return to the UK recorded the live album ‘Live, In The Moment’, their first live release since 1984. Jon has also toured in the UK and Europe with the band and has played drums on their new album, due in 2019. In 2016, Jon toured with singer Ian Gillan (Deep Purple) and Don Airey (Ozzy Osborne/Rainbow/Deep Purple) in Russia and Eastern Europe backing a 40-piece philharmonic Orchestra playing Deep Purple songs and some of Ian Gillian’s solo songs. They played ten arena shows, including one at The State Kremlin Palace Theatre with The Moscow Philharmonic Orchestra, filmed for a live DVD. Jon has continued working with Don Airey, touring across Europe, playing drums on his 2018 solo album “One Of A Kind” and more recently laying down tracks for a 2019 follow up. He has also recorded Drums for the latest album from guitarist Simon McBride with bassist / producer Dave Marks. In 2017/2018 Jon also played drums for Rock Supergroup Snakecharmer, depping for Harry James (Thunder). Jon has his own band, RenattaJane who he regularly gigs and records with – their latest EP is available on iTunes. Jon has also played / recorded with: Simon McBride, Rob Harris (Jamiroquai), Snakecharmer, Neil Murray (Whitesnake), Bernie Marsden (Whitesnake), Uli John Roth, Orphan Colours, Ahab, Keith Airey (Tom Jones, Nik Kershaw), Alex Meadows (Tom Jones), Adam Wakeman (Ozzy Osbourne), Five Star, Right Said Fred, Ezio, Daniela Brooker, Danni Nicholls, The Rick Parfitt Jnr Band, The HighTown Pirates, RenattaJane and The BBC Concert Orchestra. When he is not touring or recording, Jon tutors students privately from his drum studio in Gamlingay, Cambridgeshire.